The Department of Music is an academic enrichment offering at Country Day. A faculty of three full-time teachers and five private-lesson teachers provides instruction to students in music and related coursework from pre-kindergarten through grade 12. 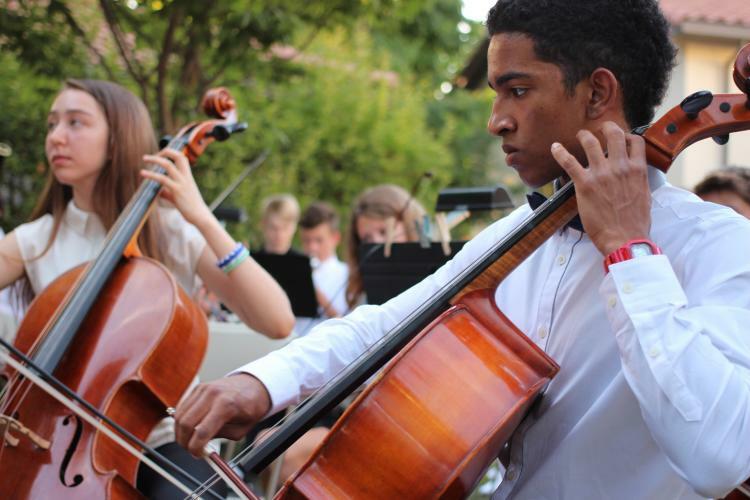 Country Day offerings include Instrumental and Choral Music for all students in the Lower School as well as offerings in Concert Band, Orchestra, Jazz Ensembles, Chamber Ensembles and Choir for Middle and High School students. Mr. Ratcliff teaches band in grades five through twelve and the middle and high school Jazz Bands. He has a Bachelor’s degree in Music from the University of North Texas and a Master’s from Washington State University. Elena Bennett earned her BA from Cornell University and a Master’s degree from the Yale Divinity School. She teaches music to pre-kindergarten through fourth grade. Felecia teaches 5th-12th grade orchestra, chamber music, and choir. She earned her BA from Patten University and her MA from California State University, Chico. Instrumental and choral music is offered to pre-k through grade four and emphasizes the fundamentals of music and performance. Classes meet three times per week. Performances held throughout the year include singing and playing recorder, ukulele, Orff instruments, and percussion. Students are given many opportunities to step up to the mic, act out a part, or give oral presentations as part of the Music and Performing Arts curriculum. Band and Orchestra are offered in grades five through high school. Instruction is offered through electives in the Middle and High school and as part of the curriculum in fifth grade. Performances emphasize standard repertoire and are held throughout the year. Chamber Ensembles and Jazz Band are offered to advanced students. Entrance is by audition and director approval. These groups emphasize performance and are a showcase for County Day. Private Lessons are offered after school through the After-School Enrichment Program and are available to any student on all band and orchestra instruments, guitar, and piano. In the spring of each year, the music department invites faculty, parent, and former-student musicians to join current students in the Megaband for a one-day performance. The music is posted on the website and musicians can practice on their own time. The Megaband plays as part of the annual Rulindo play-a-thon, an eight-hour marathon of music featuring musicians of all ages.